The Timestone Internet Ordering System (IOS) includes the ability to generate custom 'coupons' that can be used online to discount an order. Coupons are defined via a simple to use, secure web interface. Access to the coupons is protected by a username and password. These credentials are the same as those provided to you in order to gain sFTP access to your site. Defining coupon codes is simply a matter of giving the coupon a code and a discount amount either as a fixed amount or a percentage of the order. The coupon can optionally also be given an expiry date and a minimum spend amount before the coupon is applied. Note percentage discounts are only applied to the value of the products in the cart - they are not applied to tax and postage fees. A coupon defined with a 100% discount (and no other parameters) acts to completely bypass the payment gateway. Such a coupon is very popular for internal use where staff can enter orders into IOS without payment. To avoid confusion and variation as to how dates are handled from browser to browser, it is highly recommended the expiry date be entered in the international format yyyy-mm-dd. Note it is also possible to enter an expiry time by entering a T: followed by the time in the 24 hour clock format. 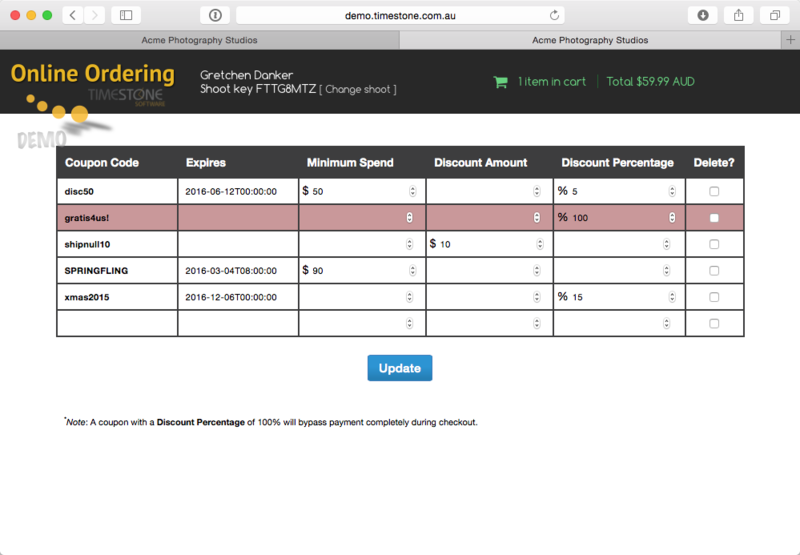 For demonstration purposes the reader can define their own coupons and see how they are applied to our demo site. 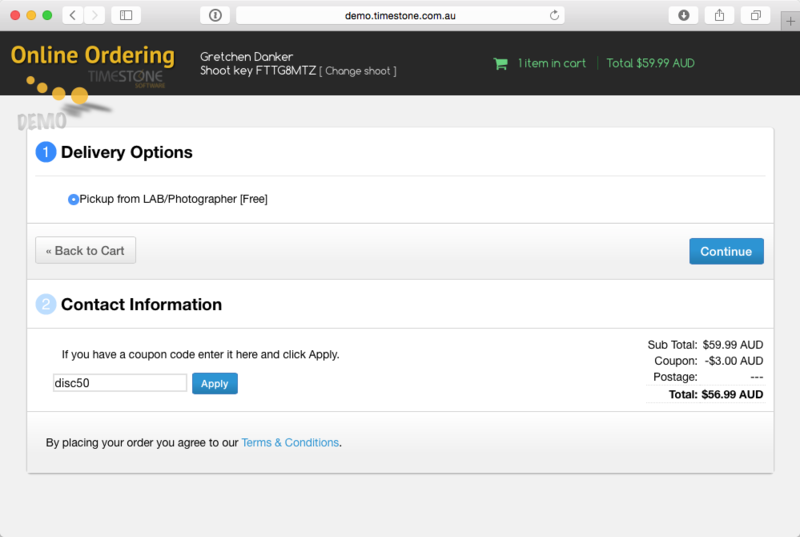 Define the coupons at http://demo.timestone.com.au/admin/coupons.The username and password are both 'demo' (without quotes).